Carolyn Miles is President & Chief Executive Officer of Save the Children, an organization that gives children in the United States and around the world a healthy start, the opportunity to learn and protection from harm. The global Save the Children movement currently serves over 185 million children in the US and in more than 120 countries. As a global organization, Save the Children has committed to driving down the numbers of preventable deaths of children under 5, ensuring every child gets a high-quality basic education and protecting all children from harm. Miles has served on numerous boards, including Blackbaud, InterAction, USGLC, MFAN, Academy of Education, Arts and Sciences, FSG and the University of Virginia’s Darden School of Business, where she received her MBA. 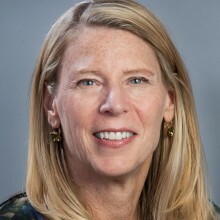 In addition to her current service on the Darden Board, she is the Co-Chair of the US Global Leadership Coalition (USGLC) and is the Chair of InterAction, the largest coalition of US-based NGOs. In 2015, Miles was named one of the 50 World’s Greatest Leaders by Fortune magazine and inducted into the CT Women’s Hall of Fame. In 2017 she received the Distinguished Alumna Award from the Maxine Platzer Lynn Women’s Center at the University of Virginia. Miles is married with 3 children.